Higher oil prices seem to have given OPEC the confidence that it needs to begin thinking about moving forward, and with Russia in the mix as well, it appears as though the alliance will be a force to be reckoned with. 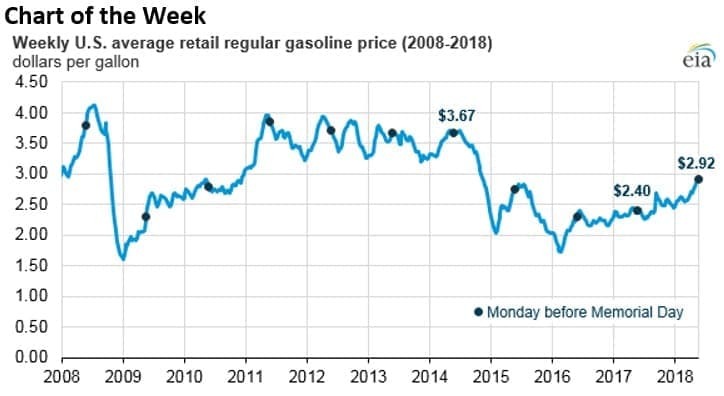 - Gasoline prices averaged $2.92 per gallon for the week ending on May 21, and have surpassed $3 per gallon in regional markets. - The prices are the highest for the Memorial Day weekend in four years. - However, prices are likely to fall back soon with crude oil prices plunging over the past week. • Subtropical storm Alberto forced ExxonMobil (NYSE: XOM) to evacuate non-essential staff, while both Chevron (NYSE: CVX) and Royal Dutch Shell (NYSE: RDS.A) shut down production platforms in the Gulf of Mexico. But by Tuesday, the storm had weakened and Chevron restored production. • PG&E (NYSE: PCG) fell nearly 5 percent on Tuesday after an investigation found that the utility’s poor maintenance led to trees falling on power lines, which started wildfires last year. • Royal Bank of Scotland (NYSE: RBS) said it would stop providing funding for new coal-fired power plants, coal mines, oil sands, Arctic oil, or peatland clearance projects. Oil prices have fallen more than 6 percent since Thursday on news that OPEC could increase production. The next steps, however, are unclear. Is a deeper price correction in order? Or has the steam been let out of the market, pushing prices down to sustainable levels? Obviously, OPEC and Russia hold all the cards for the next few weeks. Saudi-Russian deal not done yet. While Saudi Arabia and Russia have reportedly agreed to increase production, even as they continue to negotiate over the specifics, reports suggest that there isn’t agreement from the rest of the OPEC/non-OPEC to go along. In fact, several producers are opposed to adding some production back into the market. “It might be a contentious meeting,” Ed Morse, head of commodities research at Citigroup Inc., told Bloomberg. Some opposition is not surprising since higher production levels would presumably come from Saudi Arabia and Russia, at the expense of other countries who are already producing as much as they possibly can. Hedge funds exit oil futures. Hedge funds and other money managers had been pulling out of long positions on oil futures more than a month before news surfaced that OPEC and Russia could allow higher levels of production, which forced a steep price correction. In fact, investors cut net-length in Brent and WTI for five consecutive weeks. That followed what had been a record buildup in bullish bets. Russia and China filling void in Iran. Russian and Chinese state-owned companies are expected to take business opportunities in Iran after European companies pack up and leave. China’s Sinopec is moving to complete a $3 billion deal to develop a section of the Yadavaran gas field that Royal Dutch Shell (NYSE: RDS.A) had hoped to secure. CNPC could take an additional $1 billion stake in the South Pars gas field from its partner Total (NYSE: TOT) if the French oil giant exits the country. A series of Russian companies have also completed deals in Iran. Canada to buy Kinder Morgan pipeline. The Canadian government is expected to announce a decision on Tuesday to purchase Kinder Morgan’s (NYSE: KMI) Trans Mountain Expansion project. A growing number of analysts had expected the pipeline company to scrap the project after concluding the political risk to the project was insurmountable. The Canadian government has worked overtime to try to keep the project alive, and had first offered to indemnify the project to reduce risk, but Kinder Morgan has not been convinced to move forward. Reports suggest the government, in a desperate bid to push the project forward, will purchase it outright for about C$4.5 billion. Then, after the government can ensure the project moves forward, it would sell it off again to a private company. Trucking protests paralyze Brazil. Petrobras (NYSE: PBR) fell more than 9 percent on Monday after nationwide protests in Brazil from the trucking industry led the government to slash diesel prices. The government has promised to compensate Petrobras for forcing it to lower prices, but the policy change sparked the selloff. Even still, the announced deal by President Michel Temer looks to be premature, as protests continue to gridlock the country. The protests could proliferate, with rumors that oil workers could strike later this week. Petrobras has urged its workers not to follow through on a strike. EU to ban single-use plastics. The European Commission proposed a ban on single-use plastic products on Monday, such as straws and cotton buds, replacing them with alternatives. The proposal would also require EU countries to collect 90 percent of single-use plastic drink bottles by 2025, according to Reuters. While the primary motivation for the limits is to cut down plastic pollution that ends up in oceans, the regulation also has ramifications for oil demand. The IEA has previously said that plastics and petrochemicals make up the largest source of expected demand growth over the next few decades, outpacing oil demand in the transportation sector. Regulatory actions on plastics could curtail demand for oil. Related: Are We About To See Another Correction In Oil Prices? Halliburton wants to bring shale revolution to Saudi Arabia. Halliburton (NYSE: HAL) and Saudi Aramco reached a deal reached a three-year deal to boost natural gas production in Saudi Arabia. Aramco wants to increase gas production to cut down on oil consumption used in electricity generation. Permian gas glut threatens to swamp oil production. A bottleneck for natural gas could force Permian drillers to shut down or curtail oil production. Some flaring is allowed, but state regulations prohibit it beyond a certain point. “If I don't have pipeline capacity and I can't flare it, the only option is to shut in the well,” Texas Railroad Commissioner Ryan Sitton said in an interview with S&P Global Platts. “And now I'm going to shut down oil production because I don't have anything to do with my gas. That is a realistic scenario that could happen.” Citibank said last week that the natural gas glut could push natural gas prices “even to zero and curtail oil and gas production.” Sitton says that the issue will start to become a bigger problem towards the end of this year. India to ignore U.S. sanctions on Iran. India, one of the largest buyers of Iranian oil, will not comply with U.S. sanctions on Iran. “India will comply with UN sanctions and not any country-specific sanctions,” foreign minister Sushma Swaraj said on Monday. I am pretty sure they never lost control. 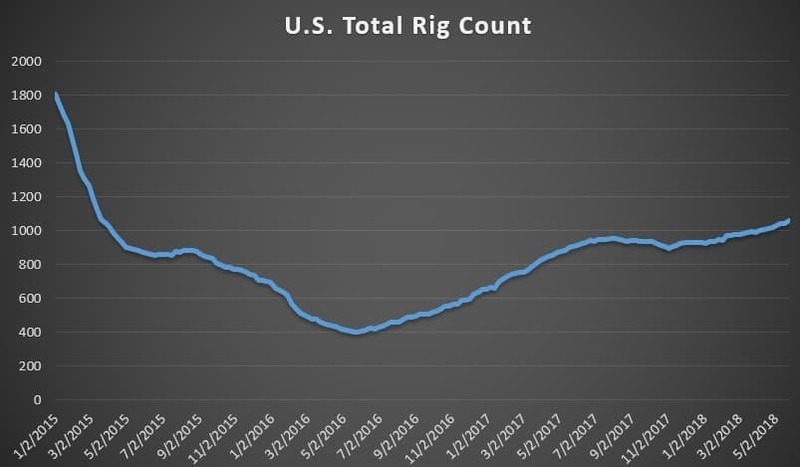 As a shale member, I think the media needs to pull back the expectations of the US Shale production and its decline curve.